Great news from Sabah, Malaysia! Last month, the Minister of Tourism, Culture and Environment Sabah announced that the Sunda pangolin, the only pangolin species found in the state, has been upgraded to a ‘Totally Protected’ species in Sabah. The new law listed pangolins in Part 1 Schedule 1 of the Sabah Wildlife Conservation Enactment 1997, meaning it is now forbidden to hunt, consume, possess, or sell pangolins or their parts and offenders could be faced with the maximum penalty upon conviction. Sunda pangolin traffickers in Sabah now face a minimum fine of MYR50,000 to MYR250,000, or a minimum imprisonment term of 1 year to 5 years, or both. Elisa Panjang, who is the Pangolin Conservation Officer for Danau Girang Field Centre, and also a member of the IUCN SSC Pangolin Specialist Group, welcomed the announcement, stating ‘the upgrading of protection status of pangolins is a huge victory for this scaly mammal, which is listed as a Critically Endangered on the IUCN Red List’. Previously, pangolins in the state were listed as ‘Protected’, meaning that hunting with a permit was still allowed, even though the species is reportedly among the most trafficked wildlife in the world. In 2015 Elisa and her team, consisting of Sabah Wildlife Department and several conservation non-governmental organizations, strived to draft the Cabinet paper on the protection of pangolins in Sabah. Realizing that the pangolin was facing extinction, she and her team felt there was a pressing need to strengthen the law to protect its remaining population. Elisa believed a deterrent sentence should be given to wildlife traffickers not just a ‘slap on the wrist’, and all wildlife traffickers should be brought to justice by being prosecuted and convicted so that these offenders would think twice before committing any crime. The first pangolin workshop to be held in Sabah, in 2014, discussed the conservation of pangolins in the state. One of the main aims was to conduct in-depth research on the pangolin population in Sabah to better understand its status. Elisa is currently pursuing a doctorate at Cardiff University and she is based at Kinabatangan, Sabah studying these scaly mammals. The research is funded by Houston Zoo, with additional support from Ocean Park Conservation Foundation and other organisations. Elisa’s research is focusing on landscape ecology and the behavioral response of the Sunda pangolin to habitat fragmentation and degradation using a multidisciplinary approach, including camera trapping, sign surveys, surveys on local knowledge and satellite telemetry. She started her research in 2016, and will finish in 2023. 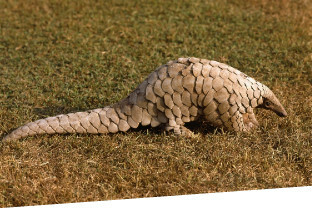 Elisa plans to organize a pangolin workshop and produce a Sunda Pangolin State Action Plan upon completion of the research. Meanwhile, apart from doing research, Elisa and her education team are also focusing on public education and raising awareness. Up until 2018, more than 500 primary school students from three districts, as well as more than 300 secondary school students learned about pangolins. Elisa is also actively participating in public talks both locally and internationally; working closely with the local media such as newspaper companies and radio stations to highlight the plight of the pangolin in the state.